Has your child broken the phonics code? Has his fluency developed past super choppy to more fluid and smooth reading? Does he understand what he reads? If so, he is ready to tackle the new frontier of beginning chapter books? Beginning readers have a whole new world of books to bridge into on their reading journey. I have the honor of chairing the Easy Reader and Early Chapter Book category for the 2016 CYBILS awards this year. It’s been fun to read some new early chapter books. I’ve included a few on this list! So, here are our favorites. My son fell in love with the Doodle Adventures. This is a series that you will want to buy vs borrow from the library because the kids need to write in the book. Yes, you heard me right. The reader writes in the book and helps to drive the story. Now, if that isn’t engaging then I don’t know what is. Technically, this book doesn’t have chapters but it has a feel of a chapter book. The text is broken up with lots of illustrating making it a great fit for new readers especially boys. There are currently two Doodle Adventure books by Mike Lowery- The Search for the Slimy Space Slugs and The Pursuit of the Pesky Pizza Pirate. The Rise of the Rusty Robo-Cat will be released in 2017. Speaking of drawing, check out My Life in Pictures by Deborah Zemke which is about Bea Garcia who loves to draw in her notebook. But, drawing doesn’t seem to help when her best friend moves to Australia and a new pesky neighbor moves in. Lots of illustrated drawings help to break up the text. Zemke is also the illustrator of another book my detective son loved, The Case of the Missing Carrot Cake by Robin Newman. Wilcox and Griswold are on the hunt for who stole the carrot cake. Who could it be? Speaking of detectives, every Nate the Great book has been read in our house. Nate the Great loves pancakes and solving mysteries for people. 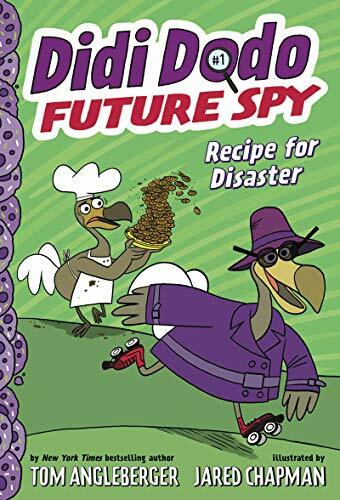 Didi Dodo Future Spy: Recipe for Disaster by Tom Angleberger is pure fun. My oldest son was immediately engrossed in the spy comedy story. We are looking forward to more in this series. Other huge hits in our house are The Princess in Black books by Shannon Hale. These have great appeal for boys and girls. Full of adventure as Princess Magnolia secretly turns into the Princess in Black. I love Anna Hibiscus by Atinuke. Anna lives with her family Africa. Sweet family stories with a dose of culture are what you will find in these stories. There are four titles in the Anna Hibiscus series: Anna Hibiscus, Hooray for Anna Hibiscus!, Good Luck Anna Hibiscus!, and Have Fun Anna Hibiscus! Travel to Colombia in Juana and Lucasby Juana Medina. Kids will identify with Juana and all the things she likes and doesn’t like. Plus, they’ll pick up a few Spanish words too. If your new reader loves adventure, The Magic Tree House series by Mary Pope Osborne will fit the bill. Travel with Jack and Annie as they climb into their magic tree house that transports them back into time all over the world. And, there are plenty of books in this series to keep kids reading for a very long time. The first 28 books are an easier reading level and shorter than the remaining books in the series. My kids also loved the audiobook version read by the author. Meet two friends in Ivy & Bean by Annie Barrows. A particular favorite with girls. All Paws on Deck by Jessica Young is one of the easier chapter books on the list with limited text on each page. However, it requires the reader to think about words that sound the same, but are spelled differently and mean different things (homophones). The book is full of dialogue with speech bubbles. For more awesome early chapter book recommendations, check out one of the lists from What Do We Do All Day? So this list should keep your new reader reading for a bit. Let me know which ones are favorites. jodie, your post made my day! Thrilled to hear your son likes the case of the Missing Carrot Cake. P.S. Apology for the typos. my computer seems to have a mind of its own. I’m so glad Robin. He’ll be so excited to know the author left a comment on the post. That will make his day. Thank you for writing it.